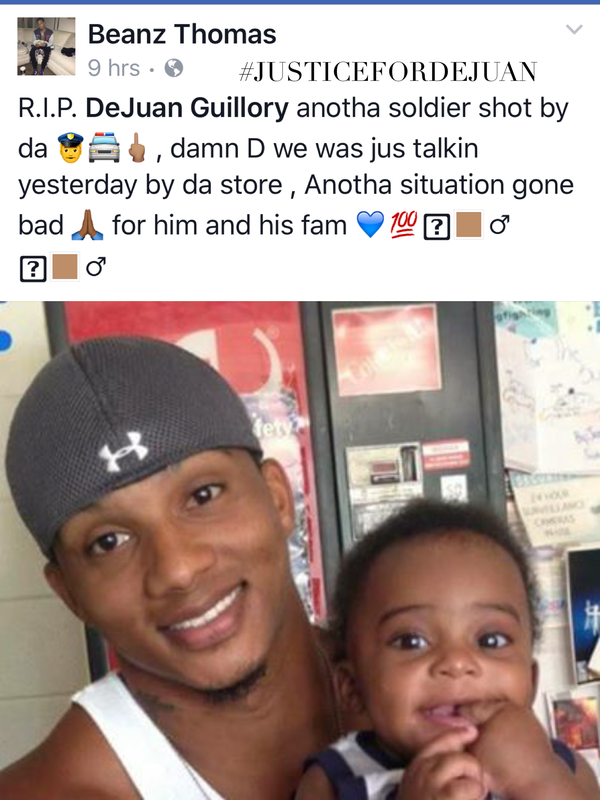 Unarmed #DejuanGullory (27), a father of three, was shot in the back by an Evangeline Parish Sheriff’s Office deputy in Mamou, Louisiana near 4:10 am on Thursday, July 6th. . There have been conflicting stories since the news broke early in the morning. According to LSP, the deputy responded to an attempted burglary call in the town of Mamou Thursday morning at roughly 4:10 a.m. 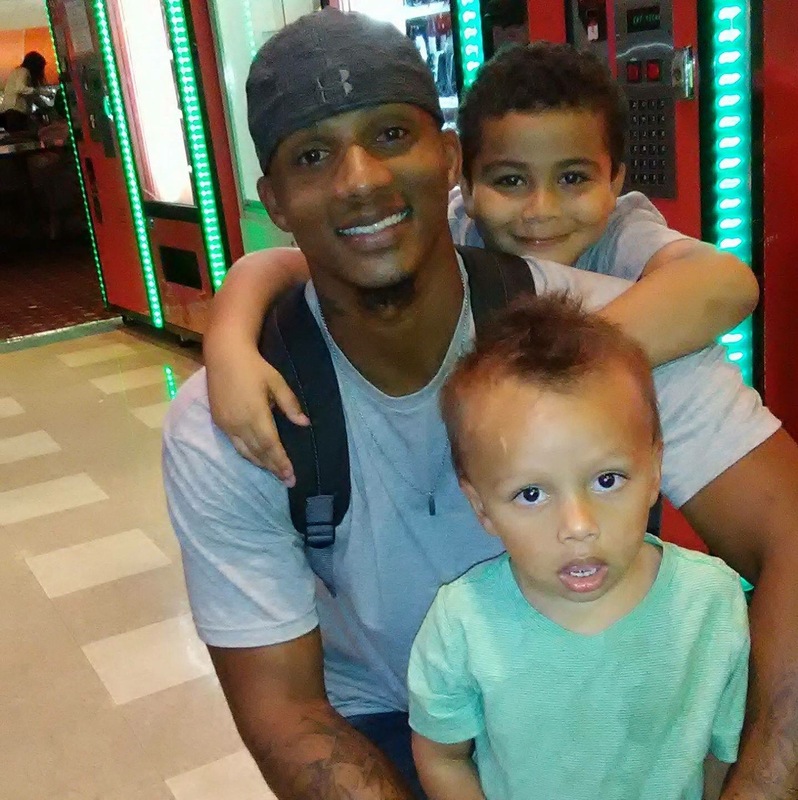 When the deputy got to the scene, he found Dejuan Guillory. 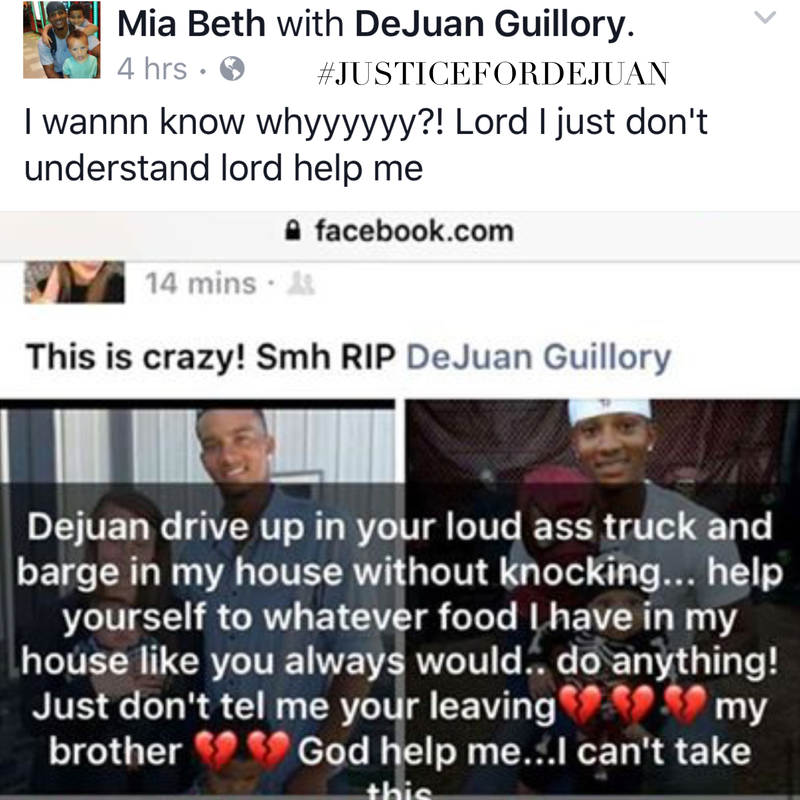 The release did not say whether Guillory was suspected of committing the alleged attempted burglary. Guillory was pronounced dead at the scene. During the struggle, the deputy was injured and was taken to a local hospital. Officials did not provide details regarding his injury. 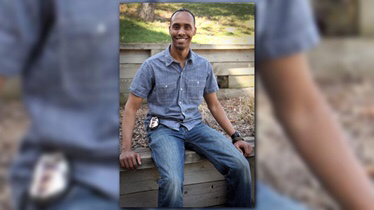 The deputy, whose name was not provided, is reportedly in stable condition. Later in the evening, investigators with LSP arrested Dequine E. Brown, 21, of Church Point in connection with the case. 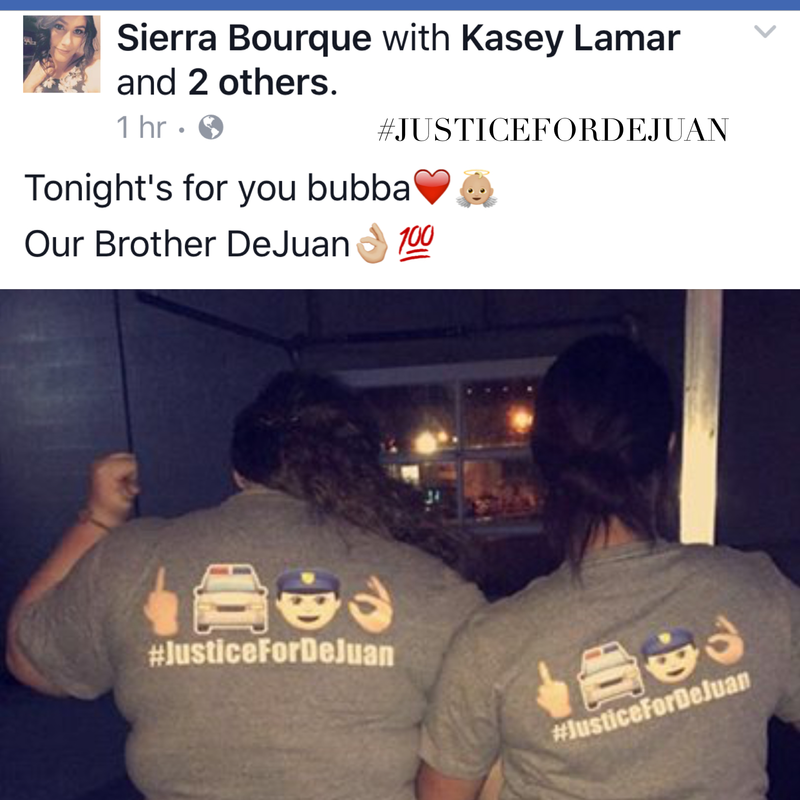 Officials say Brown was with Dejuan Guillory during the incident. She is charged with attempted first degree murder of a police officer and was booked into the Evangeline Parish Jail. Mamou, LA- Ville Platte Deputy Paul Holden LaFluer was the officer involved in the shooting this morning. 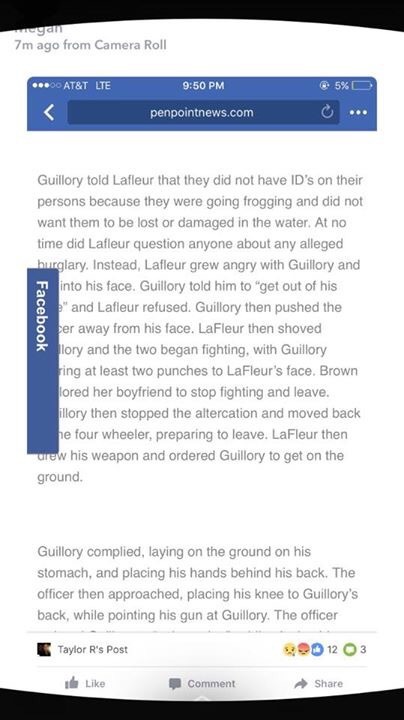 According to the family, the girlfriend of Deputy LaFluer had been having an affair with Guillory. 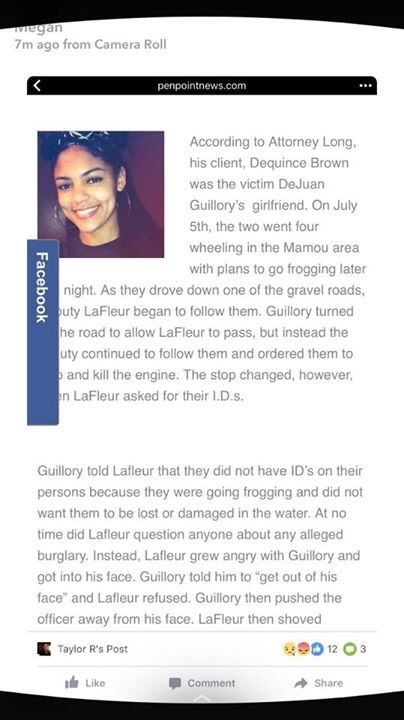 Between 4-5am, Guillory and the girlfriend of LaFluer were out riding Guillory’s 4-wheeler to catch frogs; frogging. 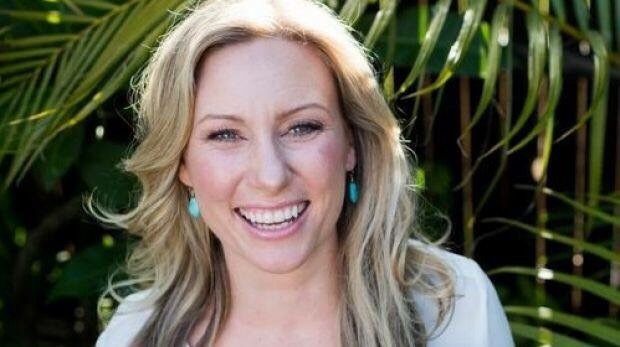 It’s reported that the officer sustained injuries in the scuffle that ensued but no gunshot as originally reported. 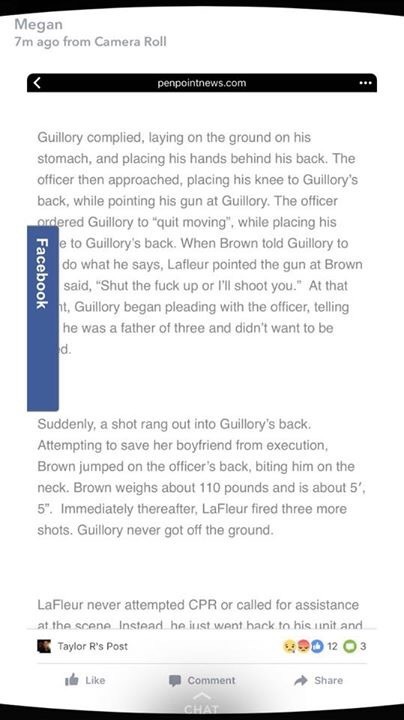 Guillory was unarmed although his fists are considered deadly (fighter). 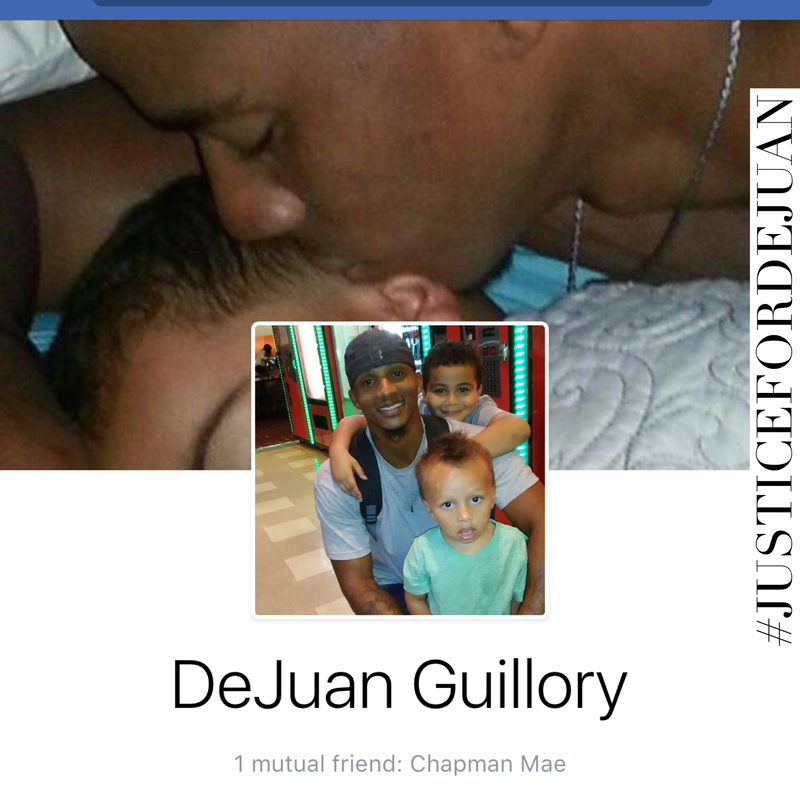 The family of DeJuan Guillory viewed his body and said that DeJuan Guillory was shot 4 times in the back. They saw NO exit or entry wounds on the chest. 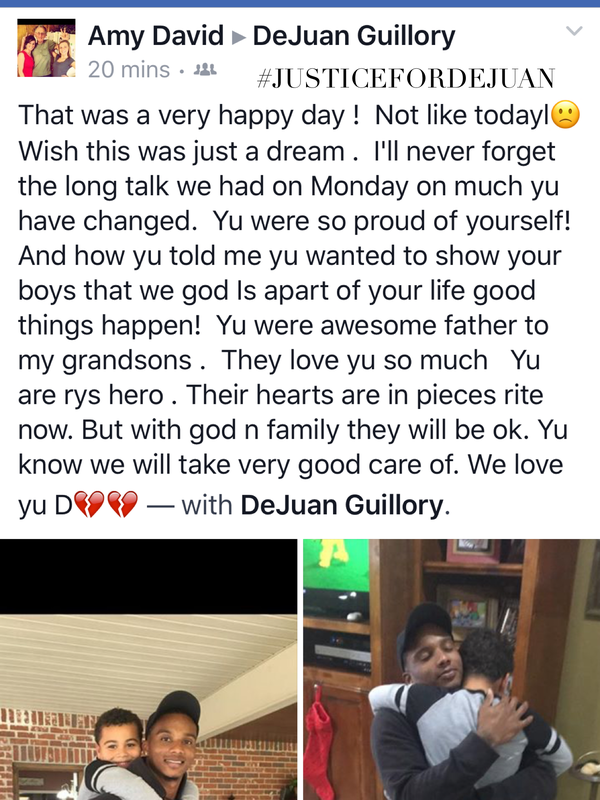 It is speculated by family members that because Guillory has a record and has recently served time for attempting to stealing an ATM, family members believe police said the deputy was there to investigate a burglary. 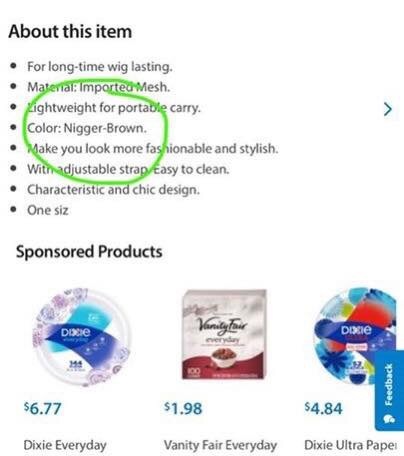 He’s beloved in the community by all races. All-star athlete, father, and business owner, Guillory fell on hard times and took to crime when he was younger. He turned his life around. He was seen last night in a good mood from being paid on a big concrete project. 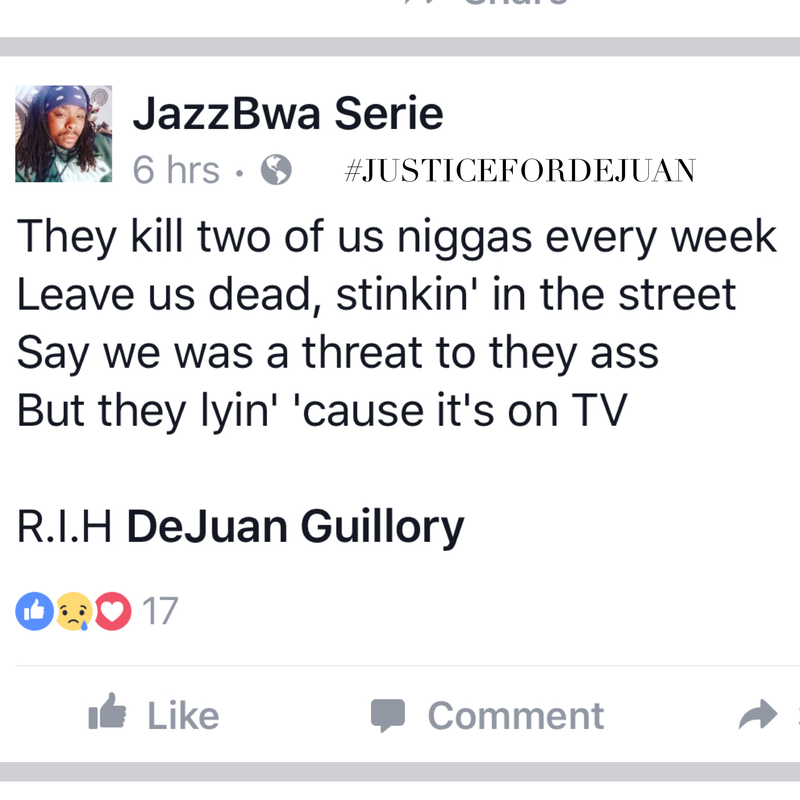 His family and friends are speaking out saying he had no need to steal anything. 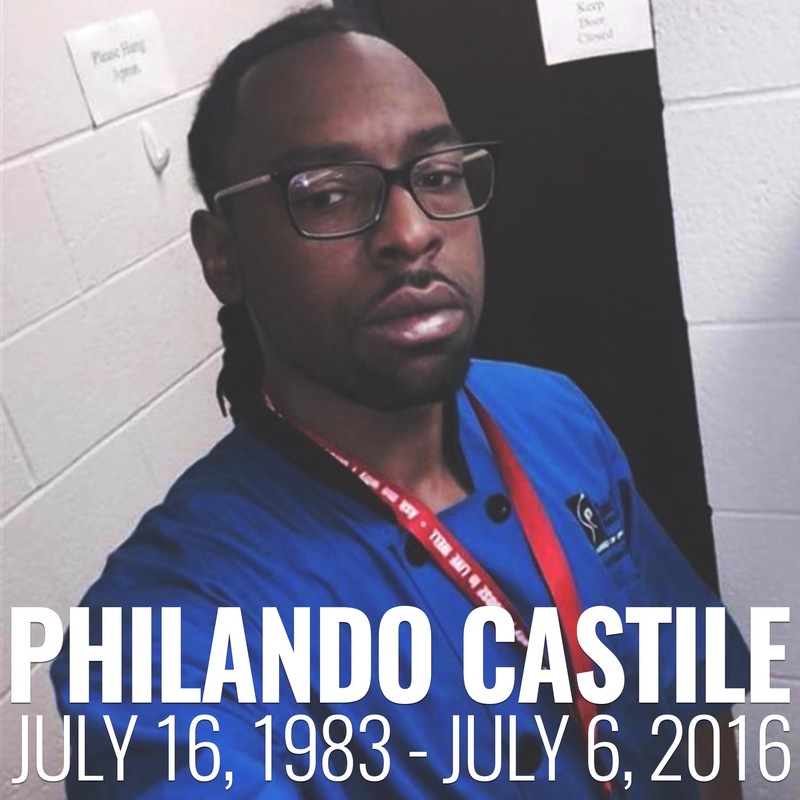 There is an outpouring of support for him on social media but the local media is not reporting on any details other than him being a possible suspect. Community members in Evangeline Parish have stressed that their parish has a reputation for being the most corrupt department in the state. 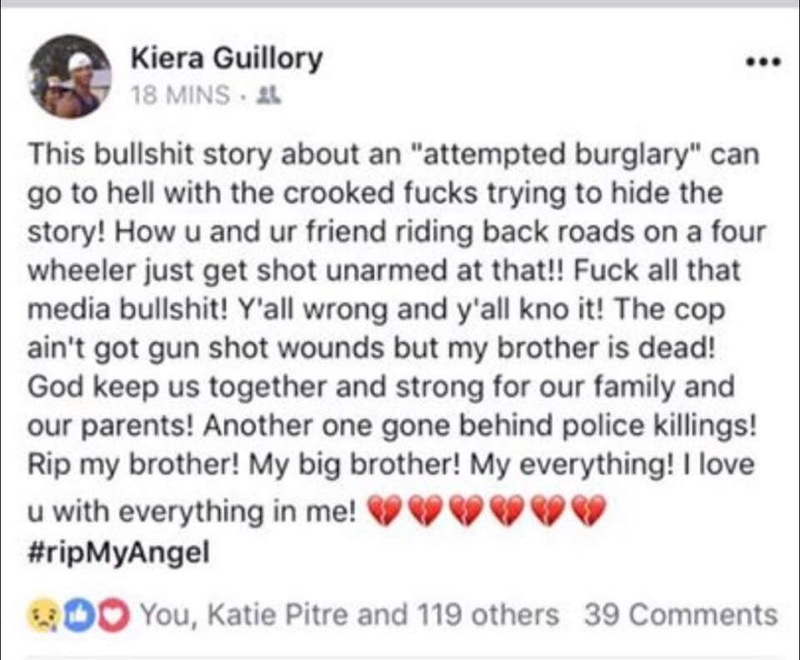 In an emotional post by Guillory’s sister, she denies the “attempted burglary” story and says her brother was riding a four wheeler with a friend unarmed when he was shot. 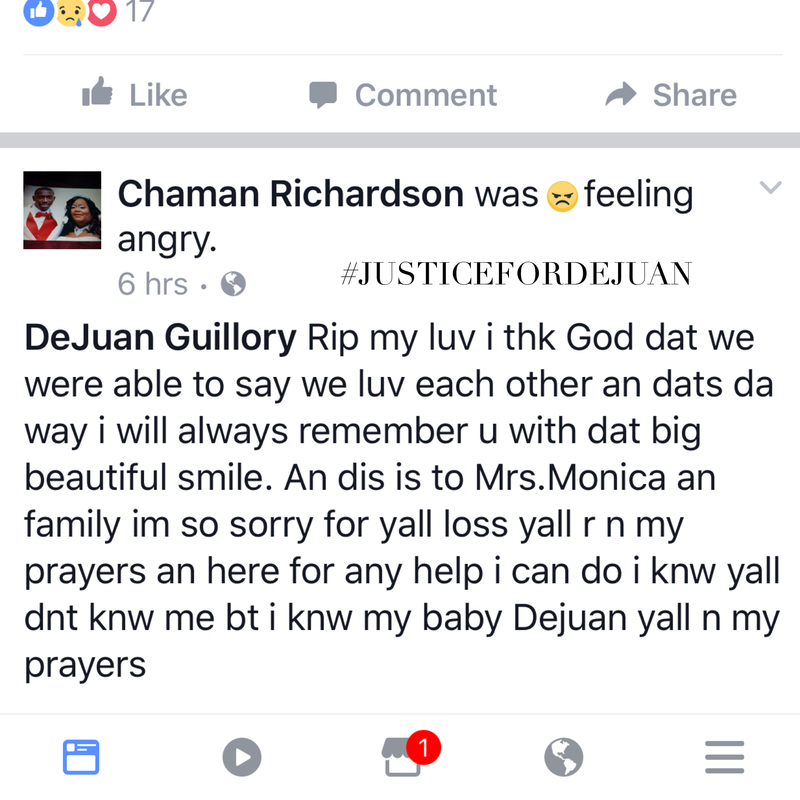 Friends and Family took to DeJuan’s Facebook page to show their respects, share memories and post their unfiltered thoughts on what really happened to him. 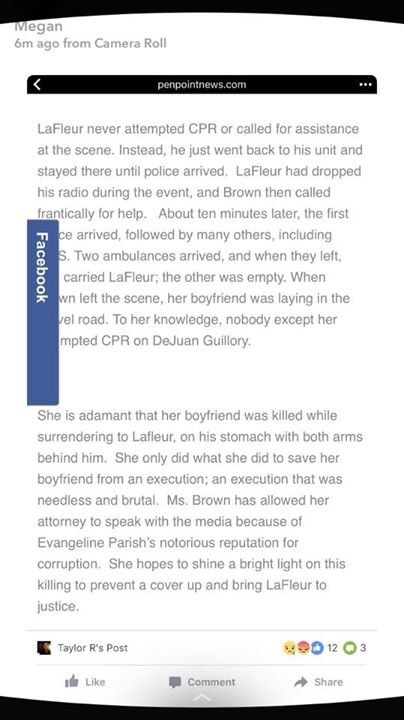 This evening it was reported by WAFB that Dequine E. Brown, 21, of Church Point in connection with the case. 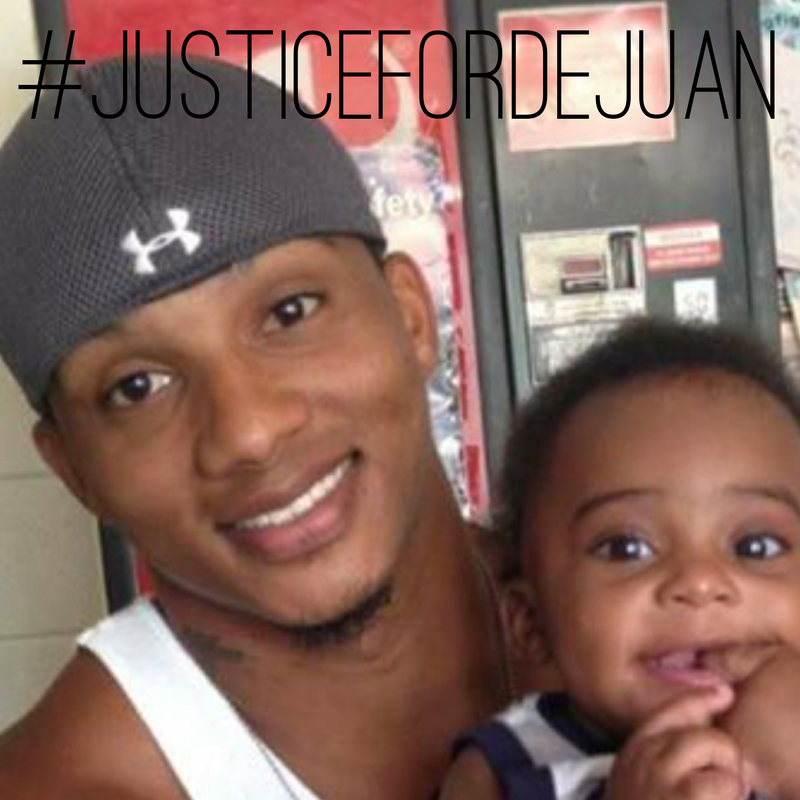 Officials say Brown was with Dejuan Guillory during the incident. She is charged with attempted first degree murder of a police officer and was booked into the Evangeline Parish Jail. 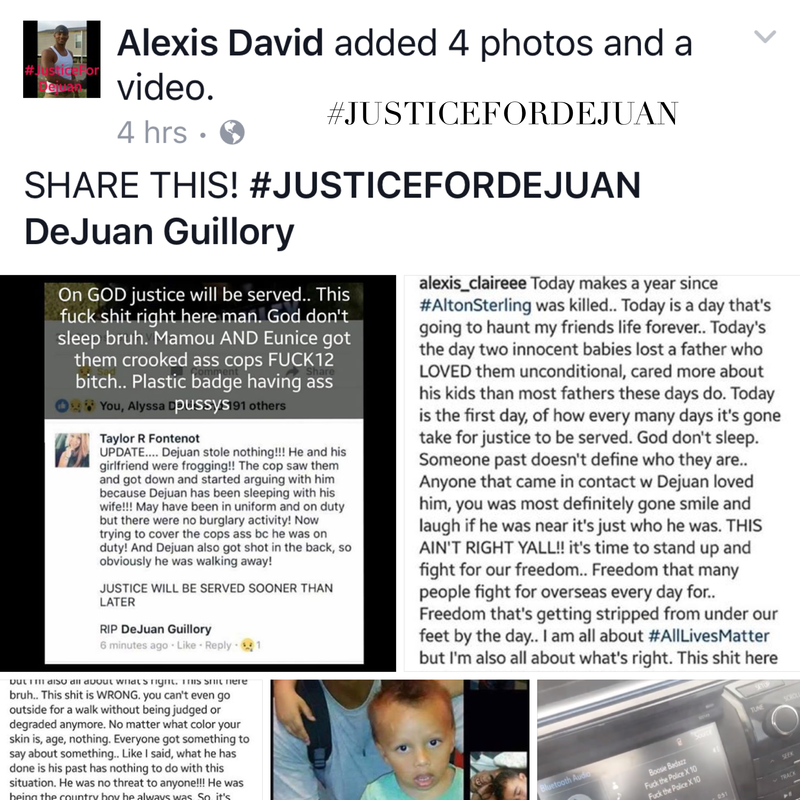 Dejaun Guillory was UNARMED him and my sister went frogging at 4AM, The officer "got a call" seen them together and killed Dejaun. 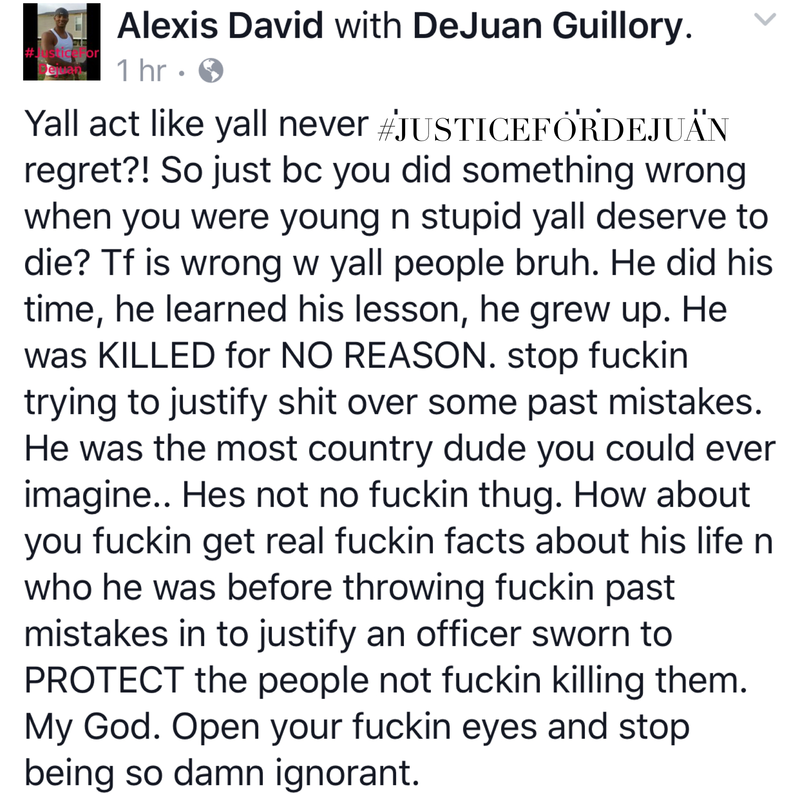 I haven't heard a damn thing about #DejuanGuillory from local news outlets. 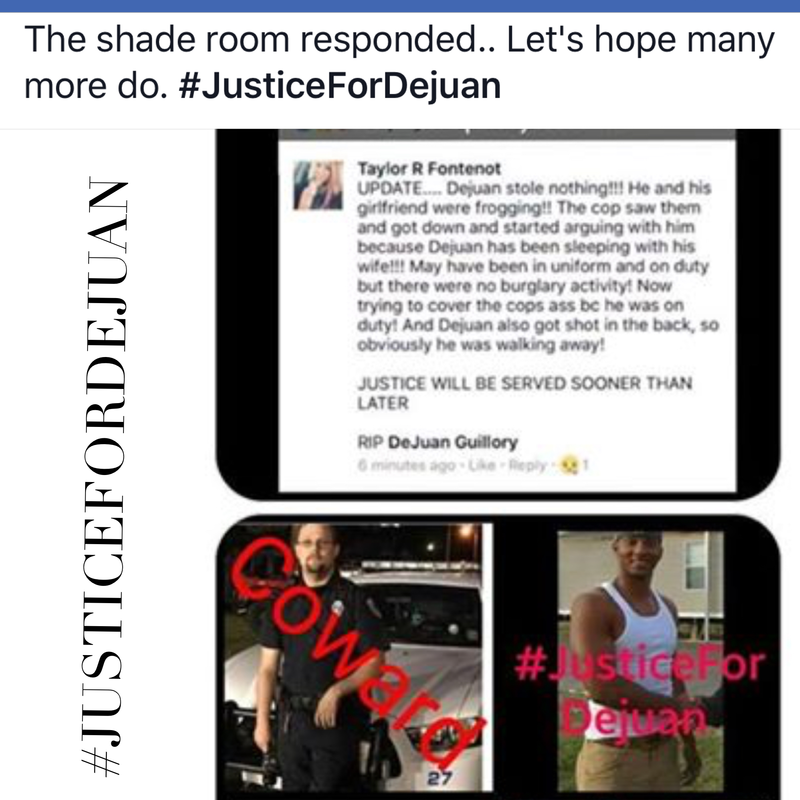 Dequince Brown’s Attorney spoke out on the case telling Brown’s side of the story including that Dejuan was laying facedown on the ground with his hands behind his back when he was shot four times and she fought the officer to try to prevent DeJuan from execution. Click here to watch the oh-so-short press conference. Never seen one last a minute and sixteen seconds before… Really? As more updates are made known, I will update this page. 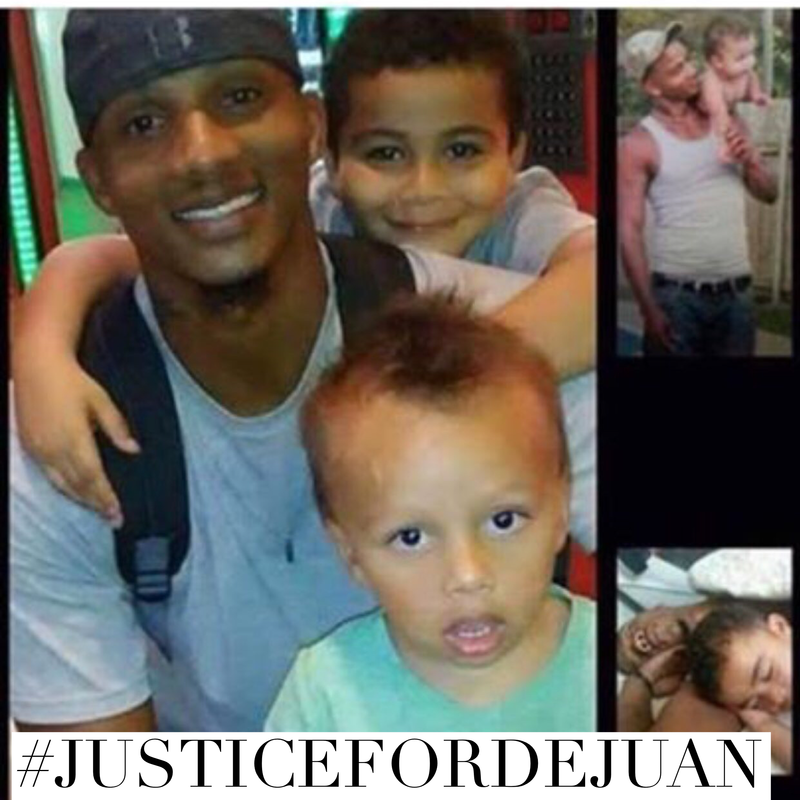 Please grab the following graphics, use the #DeJuanGuillory and #JusticeForDeJuan hashtags. Share with news, celebrities, friends, neighbors. This can’t keep happening. We must unite together to stand up against injustice. Individually we can make noise, but together we can impact and influence change! ***If you have an update you would like added to this page, tag me @iamashleyalove on social media. Ummm…I won’t just sit back and be quiet! The person I was before all this is the person I am today. It took me years to find my voice and I am going to use it to stand for what I believe in. I will not silence my voice to please others when my daughters are looked at differently than I am just because of their skin color, my best friends are black males and my kids father is a black man and I pray for all of them and every other black man and woman in America that they realize #BlackLivesMatter..Period. Yes, ALL lives matter. I matter. YOU matter. WE matter. 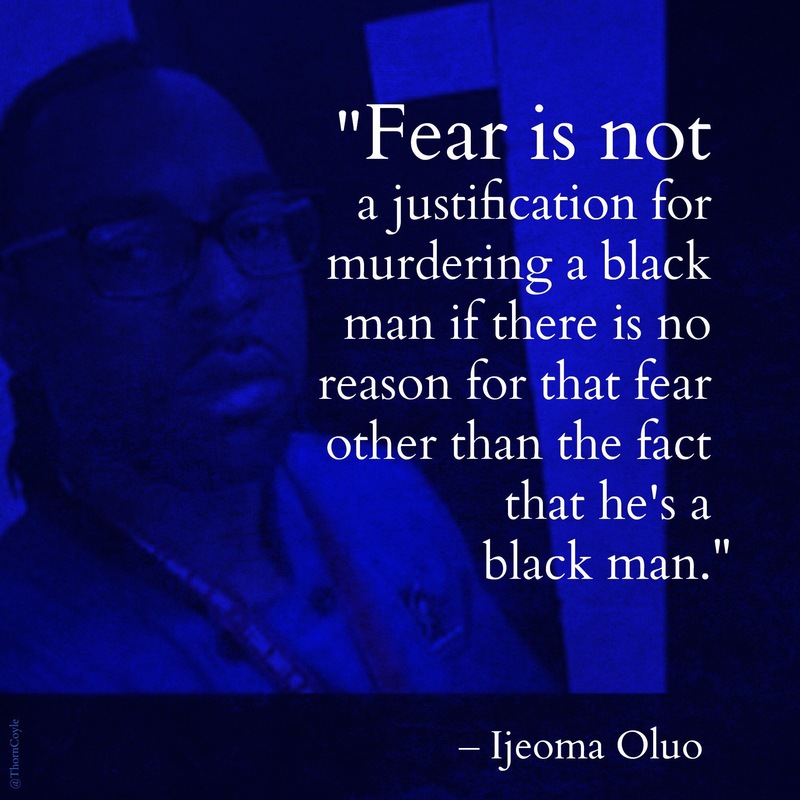 BUT until BLACK lives matter we cannot say ALL LIVES MATTER because that is not the truth. As a white woman, I have no idea how it feels to be black. I can sympathize from what I have seen happen to those closest to me, but I cannot empathize because my skin color is not hated upon every day. They do not watch me closely when I go into a store thinking I’m going to steal something. I don’t get pulled over and shot at just for being me. Although I wasn’t born into the privelidged life and money has always been kinda funny and I’ve had my share of struggles, my skin color makes me privelidged. I don’t have to worry each moment that my father or brother will get shot at the hands of those who are supposed to protect our community. 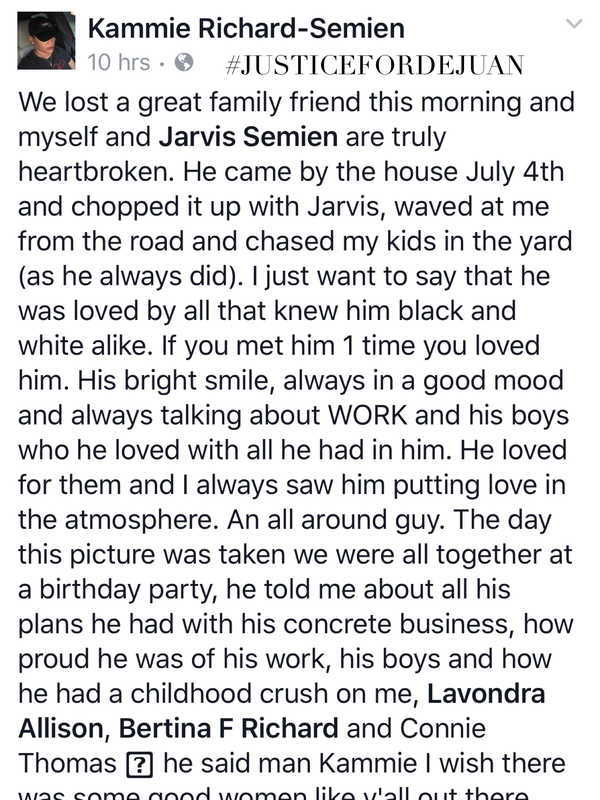 The sad reality of our society is what my three beautiful daughters who I love with every inch of me will face these facts and have to worry (already do) about their father who is a black man and their 3 brothers who are young now, but will one day be black men in America. Yes, this is a racial problem that started wayyyyyyyy before the last two murders and is happening every day regardless of whether it was videotaped or not. To conquer the hatred we must come together. 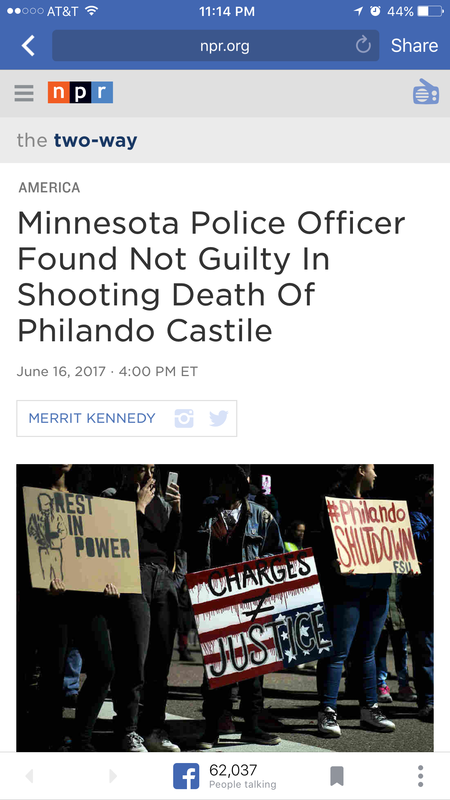 Killing innocent cops is NOT the answer and there are good cops out there who believe in the oath they took to protect and serve. Each of them has a family and kids that love them and killing them only destroys more lives and makes things worse. We must join together to start supporting one another and creating positivity in the world and in our communities. It’s action time not sit back and look at social media all day feeling bad time. If you want things to change, then it’s on YOU. And ME. And every other person to take a stand for what’s right. Our country is about to go to war within its own borders and WE are the only one who can change that. Stop talking and start taking positive, intentional action. Go to a rally, but instead of creating a riot protest in peace. 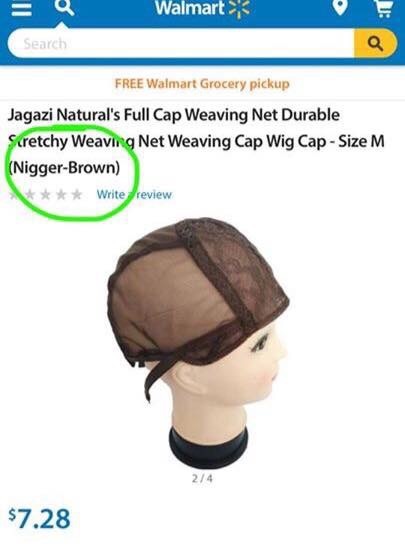 Start a black owned business. 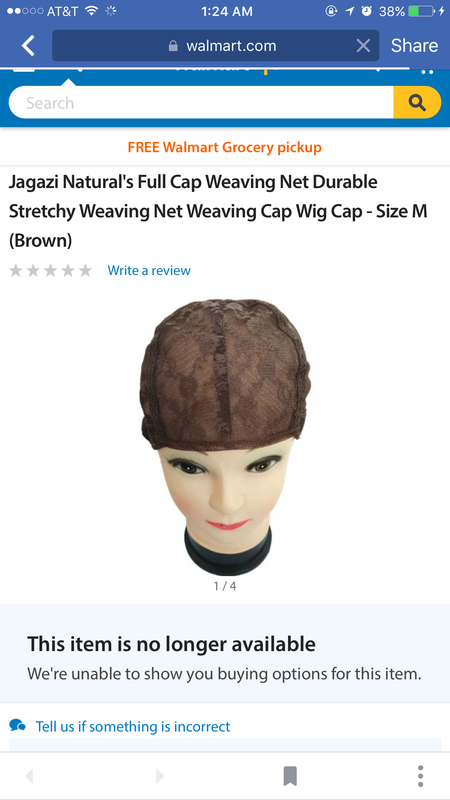 Support black owned businesses. Eat produce from black owned farms. Stop feeding the pockets of already rich CEOS by purchasing expensive shoes and purses and save your money to get off government assistance. Keep on saving and buy your family a home. Educate those around you and spread LOVE in your own communities. You are the light that your community and family needs. Do not dim your light, but shine brightly for them to see the love, strength, peace and knowledge that you bring to the table to support them on their journeys. I repeat…I will not silence my voice on issues I believe in just because it makes people uncomfortable. I love everyone and pray for each of you even those who disagree with me.